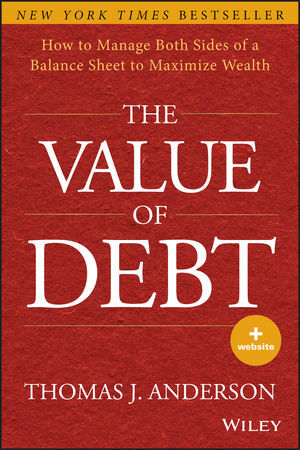 Addresses how to determine your optimal debt ratio, or your debt "sweet spot"
Offering a bold new vision of debt as a strategic asset in the management of individual and family wealth, The Value of Debt is an important resource for financial advisors, wealthy families, family offices, and professional investors. Thomas J. Anderson has an MBA from the University of Chicago and a BSBA from Washington University in St. Louis, where he majored in finance and international business. He has participated in programs at the London School of Economics, Cass Business School at City University London, ESCP Europe, and the Wharton School of the University of Pennsylvania. Tom worked in investment banking in New York before moving into private wealth management. Tom has received multiple distinctions and prominent national recognition for his wealth management accomplishments. His extensive academic studies at some of the top schools in finance and economics, international experience, and institutional background bring a unique perspective to delivering advice to the individual and on The Value of Debt.